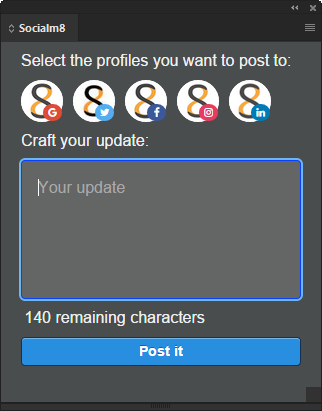 Socialm8 helps you crafting social media posts right from your creative tools. Check out what you can do with this extension! Share your designs and photos right from InDesign and Photoshop using Buffer. Just login with your Buffer account. That's it. Never ever handle files manually anymore. Enjoy the ease of use and the clarity to post from your creative tools. We are not affiliated with Buffer.